While Berkshire is still digesting these changes, we have some prepared some initial thoughts on the revisions. The proposed letters are available here. These proposed letters would require contractors to submit several new items when they respond to an OFCCP audit and require system-wide changes to how employee data is tracked, particularly as it pertains to promotions. 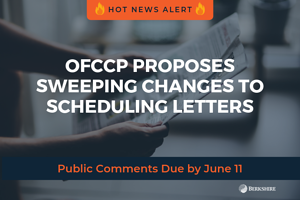 OFCCP has proposed these changes while not changing the 30-calendar day requirement to respond to the letter. If these letters are finalized with few changes, the way in which contractors complete AAPs will be impacted, and it is unclear if OFCCP will expect current AAPs to be amended to reflect information that is not currently required (and in some cases, that contractors may not be tracking at all) to respond to an audit. Some of the main differences are outlined below, by type of letter. The EO 11246 AAP is requested—and is indicated that it will only be used to help OFCCP understand the structure of the 503 or VEVRAA AAP. Since the request for the job group analysis is eliminated, OFCCP is likely expecting roster reports (at a minimum) to be included with this submission. It is unclear if personnel activity is also expected. Providing employee level compensation data, although it does not appear race or gender would be included in the file. The date the employee was terminated and whether the termination was voluntary or involuntary. Timing of the AAP: OFCCP requests update information according to when the letter is received: “if you are six months or more into your current AAP year when you receive this letter, provide the information for every completed month of the current AAP year.” Currently, a six-month update plan is generally completed and submitted if the letter is received six months after the plan date. If implemented, this requirement means that it will be difficult for contractors to be ‘audit ready’ since it is dependent on when the letter is received. Job Groups: OFCCP maintains “Contractors with 150 or more employees must group jobs by similarity of content, wage rates, and opportunities. However, contractors with fewer than 150 employees have the option of using the nine occupational groups used in the EEO-1 Report as job groups.” There has never been an affirmative requirement for contractors over 150 employees to create more discreet job groups based on the staffed EEO categories. Current OFCCP regulations specifically allow contractors with less than 150 employees to use the EEO categories—of which there are 10, not nine. Return of the Compliance Check: OFCCP states, “For example, compliance checks will provide OFCCP an efficient option to monitor contractor compliance by reaching a greater number of contractors with existing resources with a smaller contractor burden imposed during each check. OFCCP further anticipates that focused reviews will improve the compliance evaluation process by allowing the agency to use its limited resources to reach more contractors to allow for a closer look at specific elements under particular legal authorities to ensure compliance, and consequently to be able to provide more compliance assistance where necessary.” Compliance checks are returning as a quick way of the agency reaching a greater number of contractors, and the agency expects to complete about 1,000 of these reviews each year. Promotional Pools: OFCCP’s position on the request for promotional pools is interesting: “Since this information may be requested in follow-up communications with the contractors during the course of the compliance evaluation, OFCCP took into account contractor feedback related to reducing follow-up requests and expanded the question to include the pool of candidates.” It is unclear how this request fits in with existing regulations at 41 CFR Section 60-2.17(b)(2), which require contractors to provide “(2) personnel activity (applicant flow, hires, terminations, promotions, and other personnel actions) to determine whether there are selection disparities.” Contractors must “perform in-depth analyses” on this data, but there is no mention of maintaining promotional pools in the existing regulations. No More Paper Submissions: While most contractors provide AAPs to the agency electronically already, with this proposed change OFCCP states, “Specific to this information collection, OFCCP requires that contractors submit the requested information in an electronic format.” Previously, only item 19 (the compensation data) was required to be submitted electronically. Number of Anticipated Audits: OFCCP anticipates 2,500 establishment reviews, 1,000 compliance checks, and 1,500 focused reviews each year. The number of focused reviews is expected to increase from 500 in 2019 to 1,000 in 2020, and to 1,500 in 2021. 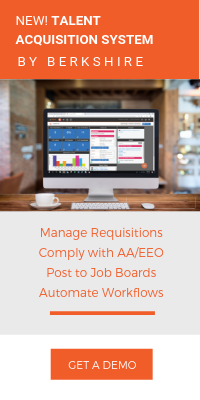 OFCCP provides average response times for each of the three letters: an establishment scheduling letter is 29 hours, a compliance check is two hours, and the focused review letters is 10.5 hours. Coupled with the potential AAP verification, the contractor community is on notice that audits are on the rise and it’s important to have plans in place as close to the plan date as possible.